We love hearing about the creative ways in which our users apply Lucidchart to solve problems and make their lives easier. We are excited to introduce "Chart Chats," a new series in which we will highlight one of these unique users each month. Meet Alexandra Yanovski of Temple University. Alexandra Yanovski has unusual nightmares. As the Coordinator of Undergraduate Strategic Initiatives at Temple University, her job is to help students stay in school and progress toward graduation. But sometimes her work interferes with a good night’s sleep. “I’ve literally had nightmares of bouncer-looking guys with course prerequisites written on their t-shirts,” she explains. What do prerequisites have to do with student retention and graduation rates? Quite a bit, according to Alexandra. She wants to find out why certain students stay in school while others don’t. She looks at both external socioeconomic factors and internal structural factors that can limit students’ progress. After combing the data, she began to suspect that the curricular paths of certain majors were holding students back. “There is something wrong with the system,” she says, “when a course has 21 prerequisites and 120 seats, but 86 of those seats are overrides.” (An override occurs when a student receives an exemption to take a class without meeting the prerequisites.) The students weren’t the only ones who were confused. Many instructors didn’t understand how their courses fit into a broader curriculum. Meanwhile, advisors with the power to grant overrides were bogged down with hundreds of requests. “If you think of every override as a five-minute conversation with an advisor, that can add up to a couple days’ worth of work over a semester,” said Alexandra. Fortunately, Alexandra found a way to meet the needs of students, instructors and advisors alike—all while cleaning up curricula along the way. Each column represents a term. 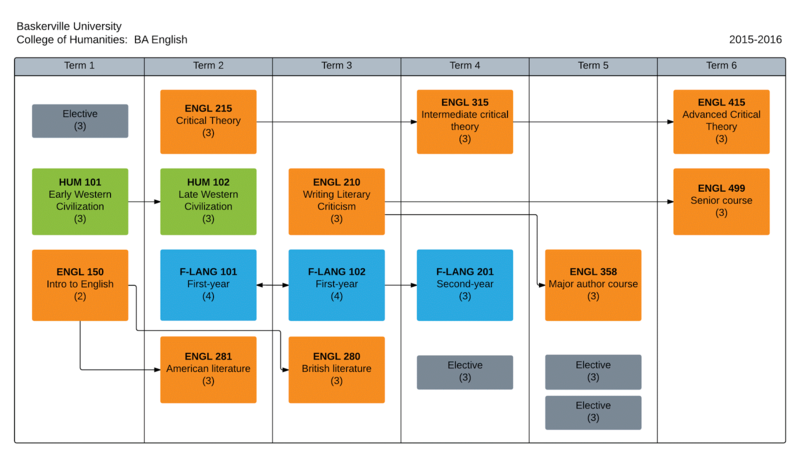 Boxes are courses, with the box color indicating what kind of course it is, such as an elective. Lines connect prerequisites to the subsequent courses. While the university can’t legally make the maps public, it can offer them to students through their advisors. 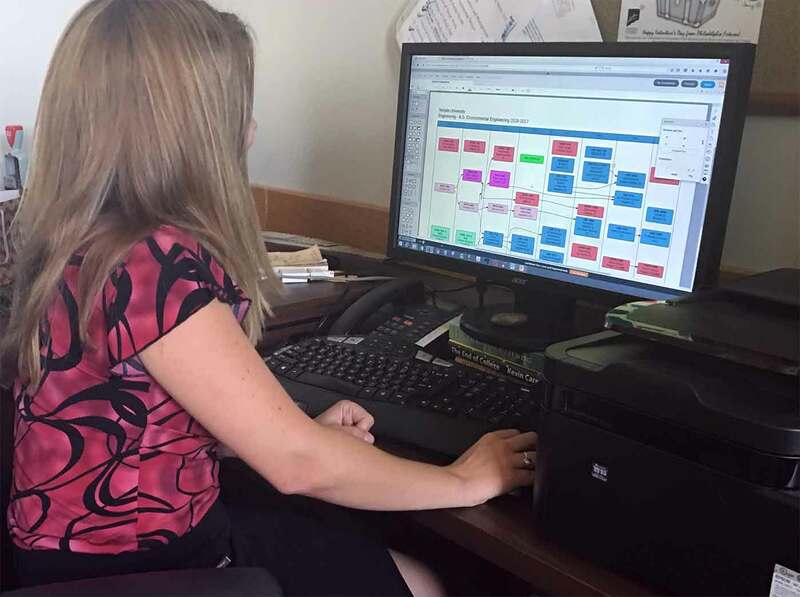 After filling out a personal copy of a curricular map with an advisor, a student can immediately grasp what classes he or she needs to take and in what order. Similarly, students transferring from another institution can see the minimum number of semesters it will take to graduate. “It’s like shining a flashlight on a curriculum,” says Alexandra. Instructors, meanwhile, can get a clearer picture of how a course is intended to prepare students for future courses, allowing them to focus on essential principles. This is particularly useful for majors like engineering and public health, where there can be a chain of six or seven prerequisites. Most surprising, however, was the number of policy changes that were made as a result of the maps Alexandra and her team created. By the time they finished their first round of curriculum mapping and recommending improvements, the requirements for over 70 majors had changed, some quite significantly. “The question we kept asking ourselves was, ‘what is it about this program that keeps them from graduating?’” says Alexandra. Having worked at several institutions of higher education, Alexandra is hopeful that her methods could be applied to the benefit of many schools. “This doesn’t just apply to higher ed. You can easily map out a curriculum in K-12 as well,” she says. Alexandra has also mapped out courses on a micro level. One of her responsibilities is to oversee a few seminar series. 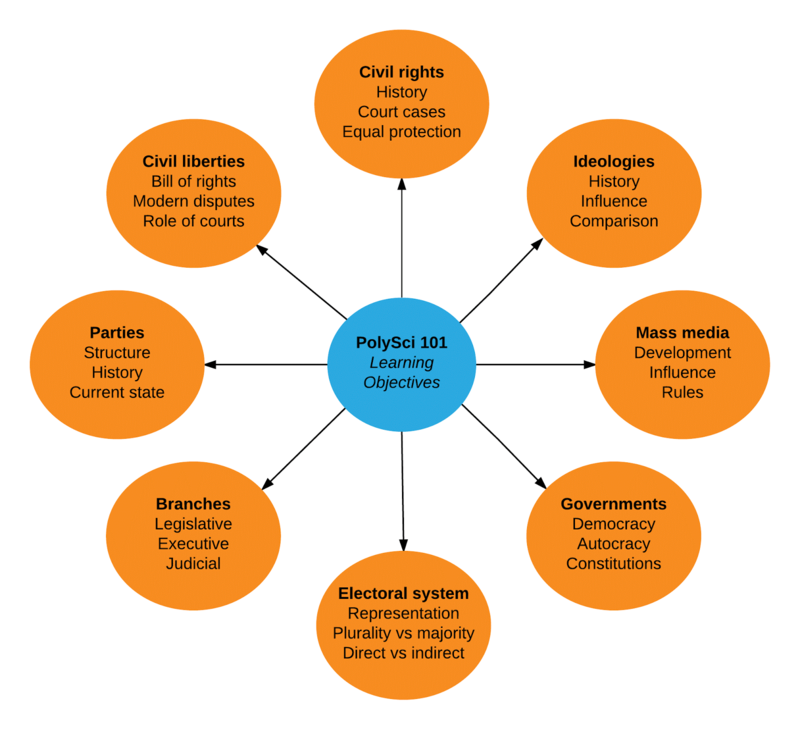 To make sure that the instructors cover all the necessary topics, she provides them with a visual syllabus, which she also makes in Lucidchart. She compares a visual syllabus to a flower petal, with each petal containing related lecture topics. The end result of Alexandra’s efforts? “If you eliminate administrative hurdles, you open up the time for more important human-to-human contact.” With the new policies in place, she also expects to see graduation rates rise as students finish school more quickly and with less debt.